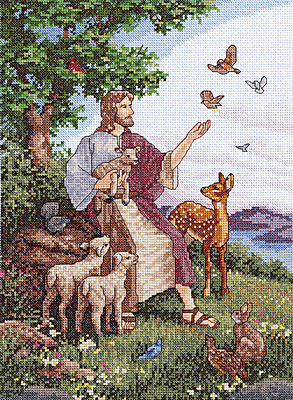 Our Jesus With Animals shows so much detail you will think it's a photograph. Our Designers and Charters have taken the time to make this one of our favorite pieces and we know you will enjoy stitching it. Each kit includes 14-count blue cotton Aida, 6-strand cotton floss, needle, chart and instructions.